We hear about it all the time. That we, as humans, need to eat less and exercise more to maintain a healthy weight. We see articles in magazines and newspapers. We see stories on the news telling us about the expanding waistlines across the nation, and it is reaching epidemic proportions. Many of us have fought this battle, and may still fight it every day. But have you thought about your pet? Is your pet at a healthy weight? We weigh every pet that comes into Tampa Veterinary Hospital, because your pet’s weight has a major impact on their overall health; just like us. According to the Association of Pet Obesity Prevention’s 2016 study, 54% of dogs and 59% of cats were either overweight or obese. The truth is that many of these pets (numbering in the millions) will die this year due to disease caused by obesity. Consider this: an average Chihuahua weighing 10 pounds is the human equivalent of a 5′ 4” female weighing 237 pounds or an adult 5′ 9” male weighing 282 pounds. All of these can lead to a shortened lifespan. As veterinarians, we check numerous parts of your pet’s body to identify whether your pet is at a healthy weight or not. You can use the same methods we do. First, using both hands, feel your pet’s ribcage. If you can feel their ribs easily, along with a thin layer of fat, it’s a good sign. Each rib should be distinct. If you can actually see your pet’s ribs, they are underweight. If you can not feel their ribs, or there is excess fat your pet is overweight. Also, check other bony areas of the body, such as the spine, base of the tail and shoulders. Just like the ribs, there should be a thin layer of fat covering these areas. If you can see these bony areas with your eyes, the pet is underweight. If you can’t feel them, the pet is overweight. Of course, use your eyes, too. Your pet should have a definitive waistline behind the ribcage. 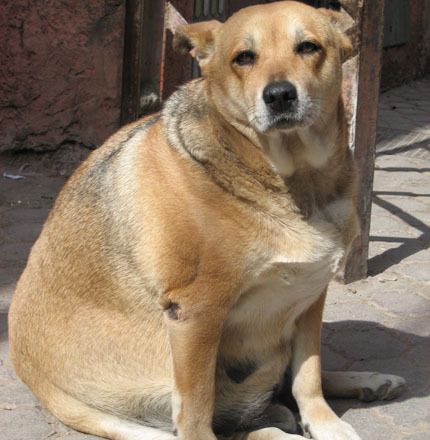 If the area between the ribcage and hips is as wide as, or wider than the ribcage, the pet is overweight. Oh no! My pet is overweight! What can I do? First, it is important to set reasonable goals and expectations. 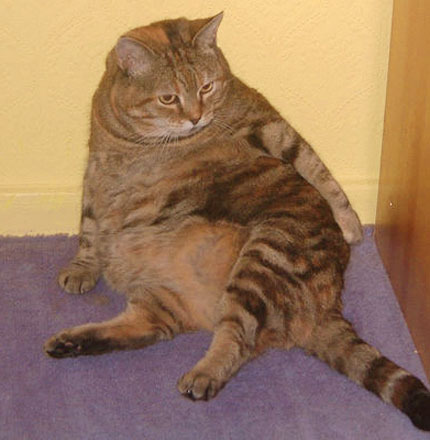 Your pet did not become overweight overnight. It will take time and patience. Ideal safe weight loss in pets is between 3-5% of body weight per month. So, if your dog weighs 50 pounds, 1.5 to 2.5 pounds in the first month is a good goal. Understand what your pet’s caloric requirements are. Speak with your veterinarian about how many calories your pet needs. Most household pets require 210 calories per day for smaller breeds up to 1400 calories per day for larger breeds of 100+ pounds. If you are unsure of how many calories you are feeding your pet, check the label on the food you are using. You may be surprised how many calories they’re taking in. We can also discuss your pet’s current diet, and see if there may be better options for your pet. There are numerous prescription diets that can help with weight loss which can help you meet your goals faster. Exercise your pet for weight loss. Of course, speak with your veterinarian about what limitations your pet may have as it relates to an exercise regimen. Naturally, walking is a great form of exercise to start. Walk with a brisk pace for the first half of your route. Don’t let Fido spend too much time sniffing the rosebushes. We’re out for exercise, remember. On the return trip home, slow the pace a little, and now you can spend some time at a leisurely pace.